The jar containing Green & Black’s Organic Hot Chocolate Drink is solid and bewitching. The drink itself? Mixed feelings. It’s Hot Chocolate Festival month in Calgary, which has me in a hot chocolate state of mind. To celebrate, I’ve decided to write about four different takes on hot chocolate in powdered mix form. I’ve already written about that classic of Canadian winters, Carnation Hot Chocolate, so that’s why I’m not going to write about it again. 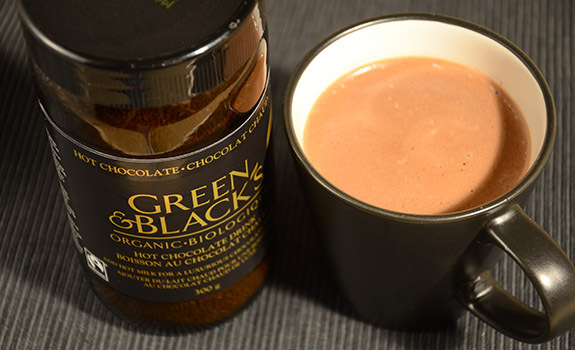 First up is Green and Black’s organic hot chocolate drink mix. The Pitch: Made in the EU (England, I reckon), this hot chocolate is heavy on morality and simple in composition. Fair trade, organic, etc. I assume that for every jar purchased, another jar is given to a homeless panda. “Add hot milk for a luxurious chocolate drink.” The ingredient list has three items: organic raw cane sugar, organic fat-reduced cocoa powder, organic dark chocolate (with sub-ingredients listed). Any creamy notes are coming from the milk in your fridge, buster. The Look: Very classy and premium-looking. The jar is made of heavy green-brown glass, and it stands out among the many plastic and foiled-cardboard containers on store shelves. Simple, understated and boldly old-school. The Cost Per Cup: As the jar is 300 g, and each cup made by direction requires 12 grams of mix, there are 25 servings in the jar. At $10.99 per jar, that divides out to $0.44 per cup. The Taste: I followed the directions, which means I made it by adding 250 mL of hot milk to 12 grams of mix. The result was OK, at best. It looks better than it tastes. At that ratio, it’s not sweet enough for my liking, and it tastes thin and scratchy, not even as good as the improvised hot cocoa I used to make at my childhood daycare centre using Fry’s cocoa powder, sugar, milk and a pinch of salt. I expected more. The Taste (recalibrated): Instead of 12 grams per 250 mL of milk (I’m using 2% lactose-free milk, in case you’re keeping score), I mixed up another mug, upping the mix quantity to 18 g per 250 mL just for the hell of it. Result? Still scratchy from the cocoa, but a much richer, more intense chocolate taste. Round, full and bright, with a hint of acidity against the mellowness. Mixed to directions, it’s like trying to listen to power-pop with the volume turned all the way down. Turn up the flavour volume, and you can better appreciate the flavour. The Second Opinion: I consulted with Aline, NEAROF!’s Vice President of Dish Acquisition, for her take. A devotee of chocolate, she declared the initial mix too weak, though the second mix was very much to her liking. It tastes like cocoa, she said, not processed powder in a can. It’s one of the better hot chocolates she’s tasted. Cost: $10.99 for a 300 gram jar at London Drugs in Calgary. Value for cash money: Not awesome, that’s for sure. But it’s organic, so the price isn’t entirely out of line. Availability: Not widespread. Check the kinds of places that stock organic products. Nutrition (DOES NOT INCLUDE MILK): Per 4 teaspoons (12 grams): 50 calories, 1 gram of fat, 0 mg of sodium, 1 gram of fibre, 1 gram of protein. Suitable for vegetarians? : Yes! It says so on the label. The verdict: Mixed to specifications, it’s just not right. Mixed to one and a half strength, it’s pretty good, with a very pure hot cocoa taste. But that also bumps the price per cup even higher, which makes it a harder sell.